Hanoi Street Food is part of the larger tapestry of cuisine in Vietnam. 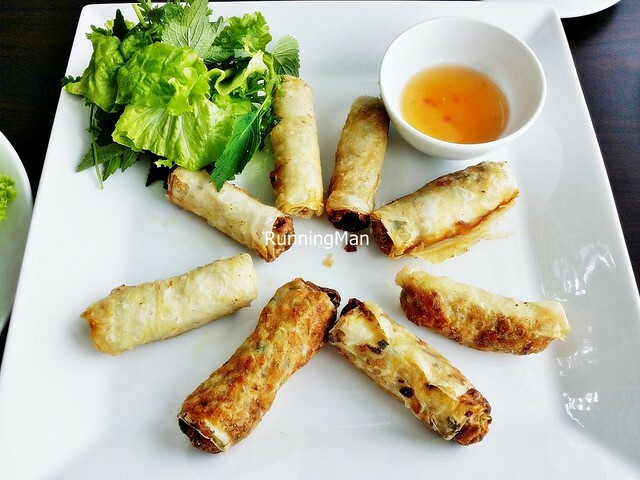 Located in the north, which is bordered by China, the Vietnamese cuisine in Hanoi is largely influenced by Chinese cuisine, as well as French cuisine, and differs greatly from the typical Vietnamese cuisine you'll get in the south. Meals here tend to be multi-course communal affairs, and dishes tend to be more distinctly savoury, sour, bitter, or salty. The city is also known for being an exotic food haven, where you can dine on snakes / cobra meat, dog meat, duck fetus, or giant water bugs / insects. Food in Hanoi can be found along the streets in pushcarts, kiosks or small cafes, on street corners, in mid-range restaurants and fine-dining establishments. 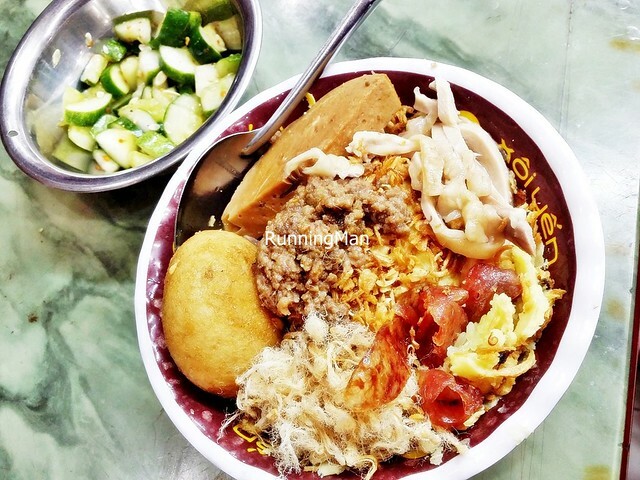 Bread, noodles, and rice often accompany a meal. Common ingredients used in many Hanoi and Vietnam dishes include fish sauce, shrimp paste, soy sauce, rice, lemongrass, ginger, mint, chili, lime, basil, duck, chicken, pork, beef, prawn, squid, crab, egg, bean sprout, cucumber, carrot, lettuce, banana, tapioca, coconut, onions, tomatoes, mung bean, mushroom and more. Locals would often consume Hanoi Street Food from various road side stalls, sitting on small, low chairs, with food served on slightly higher chairs. A typical meal would usually include 1 main meat or seafood dish, 1 vegetable dish which is usually stir fried, and 1 soup dish. Drinks / beverages are considered desserts, and are mostly taken after a meal, as a result, most drinks / beverages in Hanoi tend to be sweet. 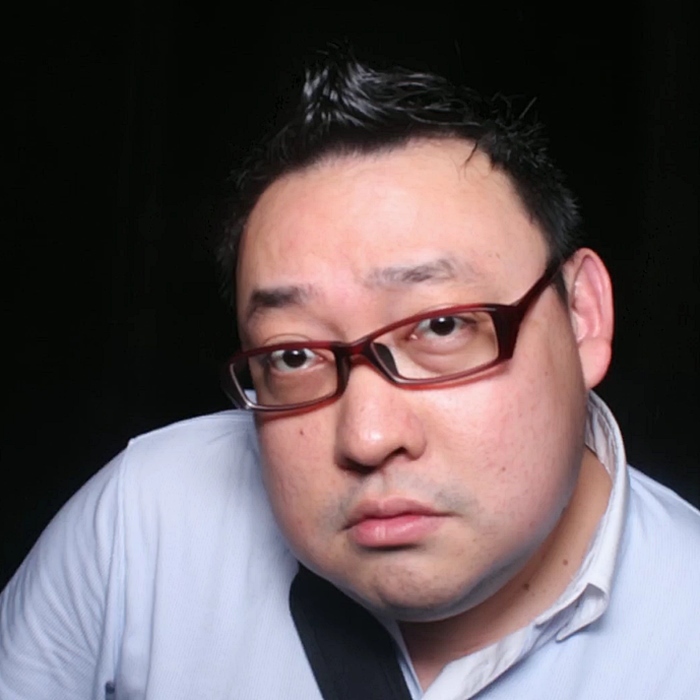 Locals here are also big fans of hot pot dining, which can be found throughout the city. The Ba Chỉ Rang Cháy Canh / Sauteed Pork Belly With Spring Onions dish is a savoury salty dish often served as part of a communal meal, and is eaten with white rice. 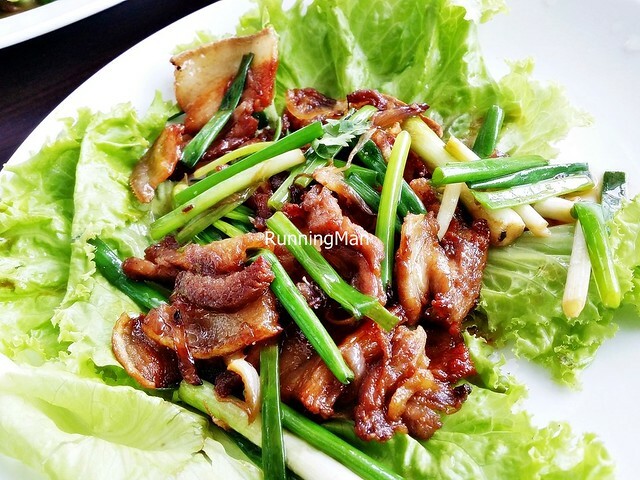 It's made by stir frying pork belly along with soy sauce, spring onions / scallions, fish sauce, garlic, sugar, onions, and pepper. Served on fresh vegetables (lettuce, mint leaves), this Chinese inspired dish is commonly served throughout Hanoi, and most parts of North Vietnam. 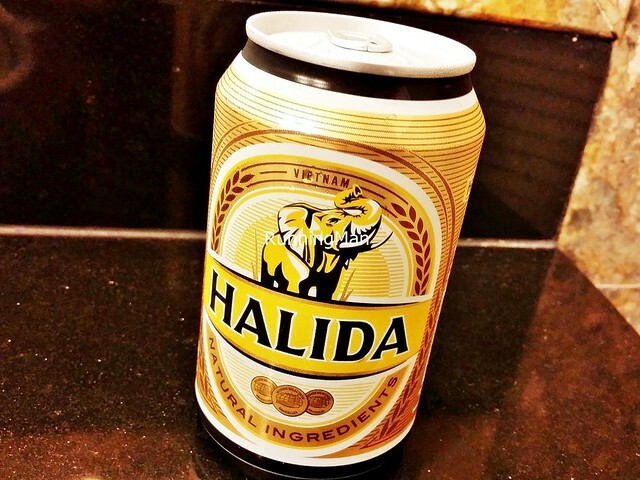 Beer Halida is a pale golden, full flavoured, yet light and refreshing beer that originated from an old North Vietnamese recipe. 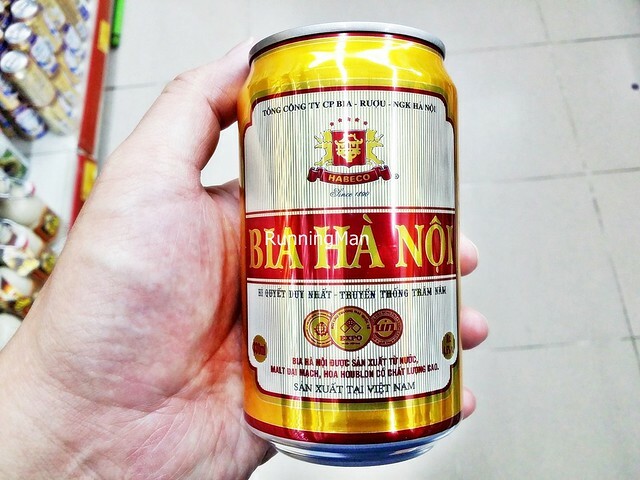 Beer Hanoi is a sunny gold, soft grain hoppy beer with a crisp, clean texture, brewed directly in Hanoi. 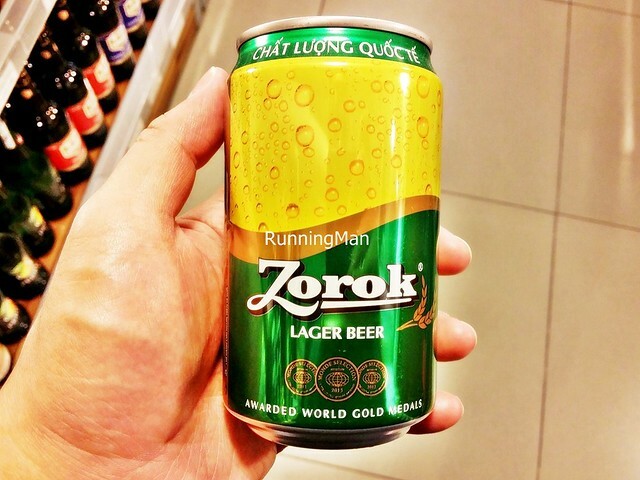 Beer Zorok is a light gold brew with a mild bitterness but a clean, light finish, with mild malt, grain, and hop on the palate, brewed in Vietnam. 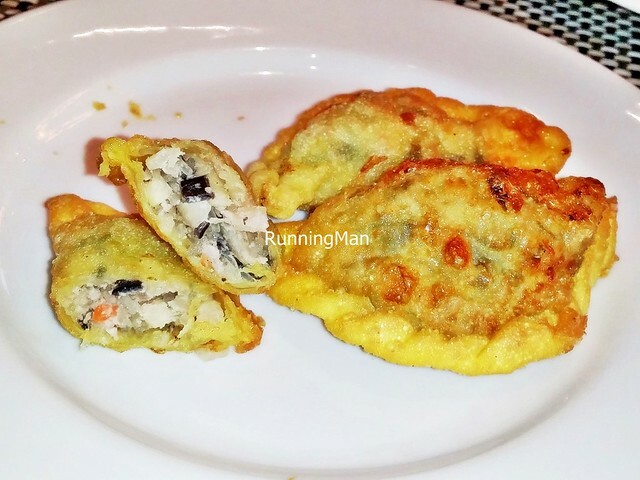 Bánh Gối / Pork Pate Pillows are savoury treats, consisting of a crisp, fried pastry shell made from all-purpose flour, stuffed with a filling of minced pork, thin rice vermicelli noodles, shiitake mushrooms, carrots, black fungus, and kohlrabi / turnip cabbage. These are often eaten for breakfast, as an appetizer, or as a snack. Bánh Khúc / Sticky Rice With Green Beans are a savoury dish which can be eaten at all times of the day. It's made with sticky rice / glutinous rice, peeled and mashed green beans, salt, rice flour, water, fish sauce, jersey cudweed / cabbage / water morning glory, sliced pork loin, and pepper, then steamed. Unlike other parts of Vietnam, or the world, the sticky rice / glutinous rice in Hanoi is usually more dry and sticky, instead of gooey and damp. 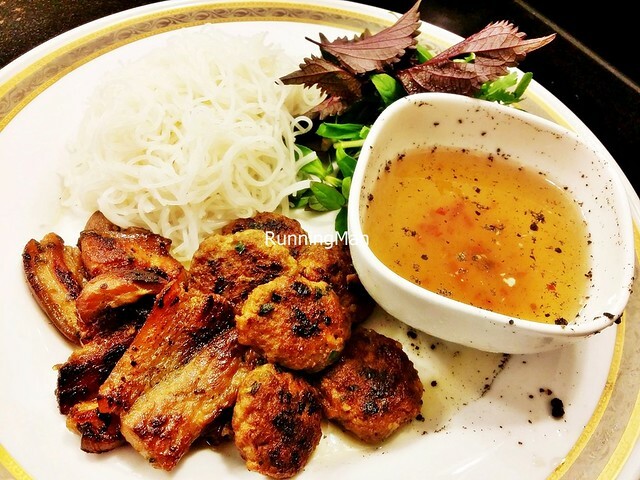 Bún Chả / Grilled Pork Noodles is a simple but appetizing dish which has a long history in Hanoi, but is seldom sold in other parts of Vietnam. A favourite everyday dish of locals, it consists of thin rice vermicelli noodles, lettuce, cilantro, mint leaves, grilled pork belly, grilled minced pork meat balls, pickled green papaya, pickled carrots, and a spicy but thin dipping sauce of chili, garlic, fish sauce, sugar, and water. Locals will often encourage visitors to the city to eat this unique, savoury, fragrant dish at least once. 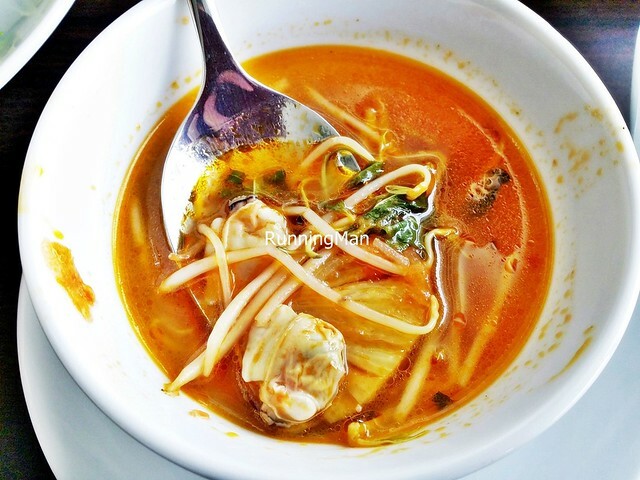 The Thai cuisine inspired Bún Hải Sản / Seafood Noodle Sour Soup is unique for its signature soup / broth, which is strongly sour, tangy, and slightly spicy. 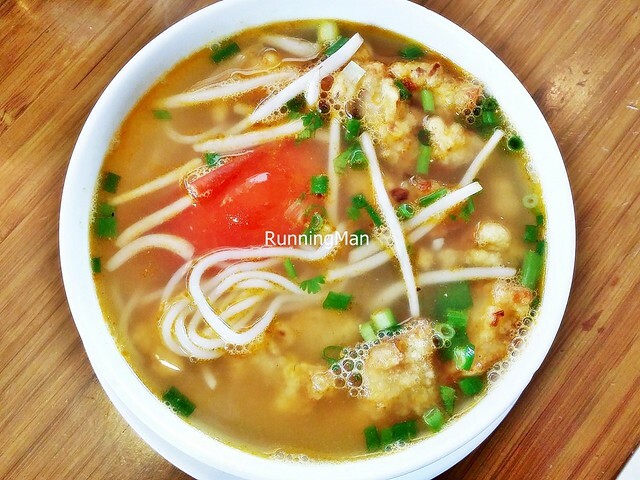 The soup / broth is made by boiling water, salt, lemongrass, fish sauce, tamarind pulp, ginger, garlic, shiitake mushrooms, tomatoes, and seafood (shrimp / prawns, squid). The result is a bright orange, savoury sour soup / broth with a little spicy kick. 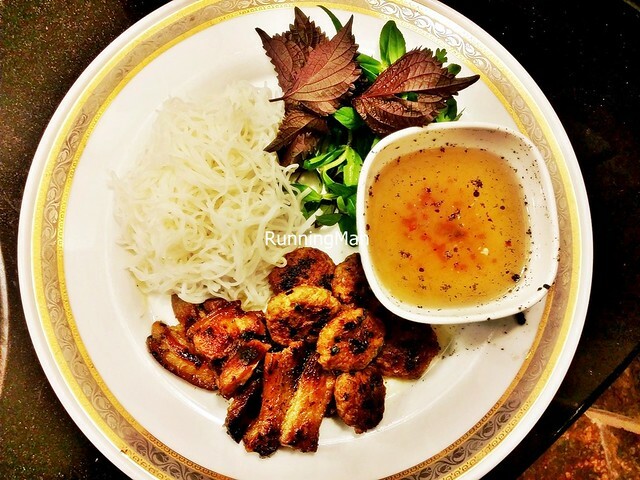 It's served with thin rice vermicelli noodles, prawns / shrimp, squid, boneless fried fish fillets (monkfish / catfish / red snapper / snakehead), spinach, and lime juice. 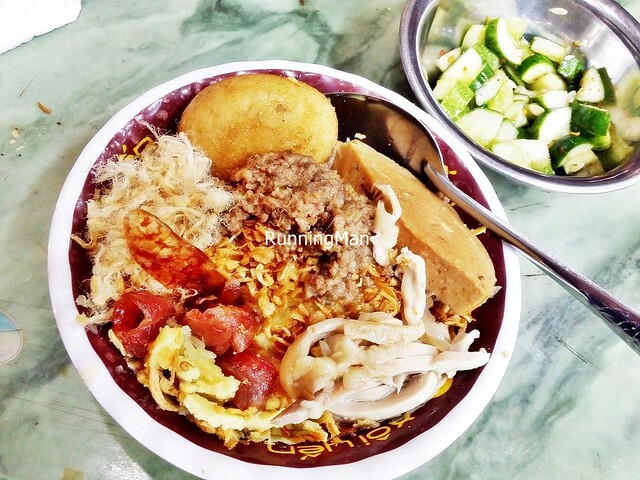 This satisfiying dish is often eaten for breakfast, or during cold weather. 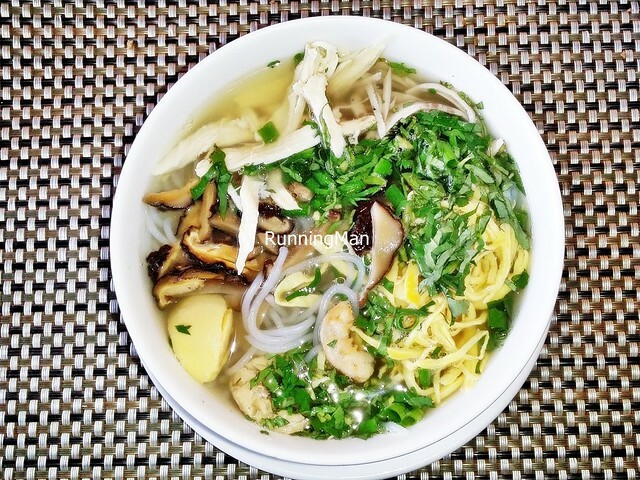 Bún Thang / Egg And Chicken Noodles is a simple dish with many variations, as part of its name means 'mixture'. 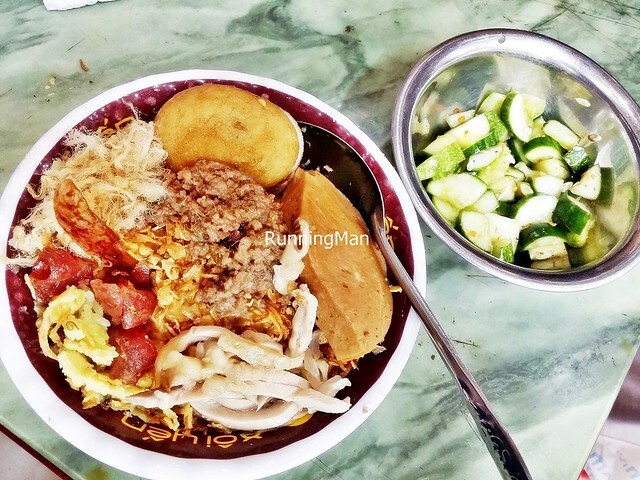 The basic dish usually has only 3 ingredients; thin rice vermicelli noodles, shredded chicken meat (from a 6 month old chicken), and shredded strips of egg omelette. The soup / broth is usually made from water, salt, fish sauce, onions, scallions, coriander, cilantro, and chicken bones for stock. 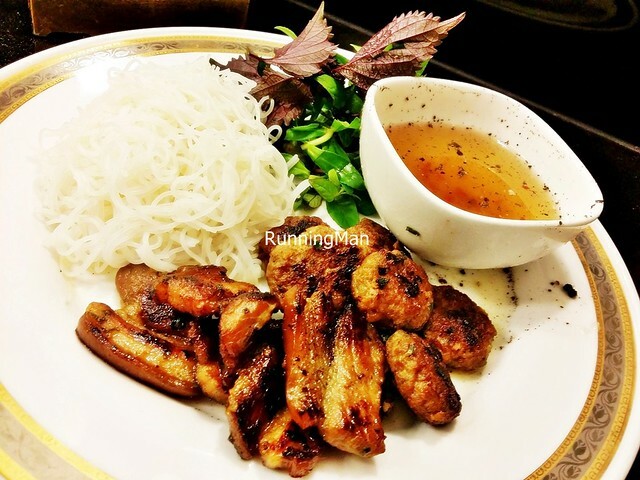 Other additional ingredients may be added as garnish on top of the usual 3, with the maximum up to 7 ingredients; including prawns / shrimp, shiitake mushrooms, pork sausage, pork loin, crushed water beetles, and bean sprouts. 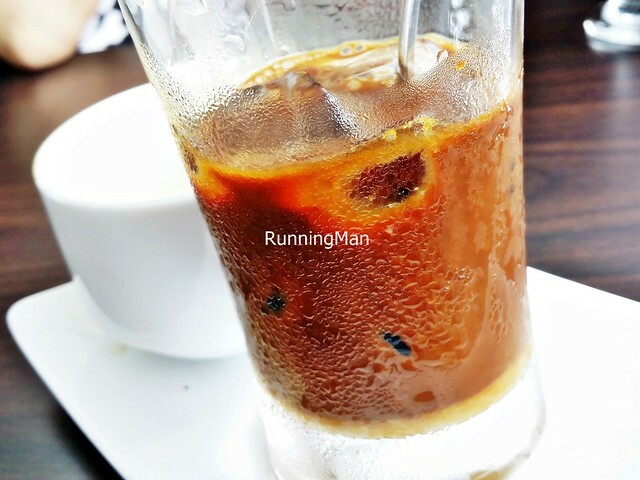 Cafe Sáng Tạo Đột Phá / Coffee Breakthrough is a very strong coffee, which I tried in a cafe that grades its coffee on strength, using a scale of level 1 - 8. This was the level 8 coffee, and it is robust, strong, deep, and thick. Really will keep you awake! Canh Cua Rau Đay Cà Muối / Crab And Vegetable Soup With Salted Eggplant is actually a traditional method of eating 1 soup with 1 snack item. 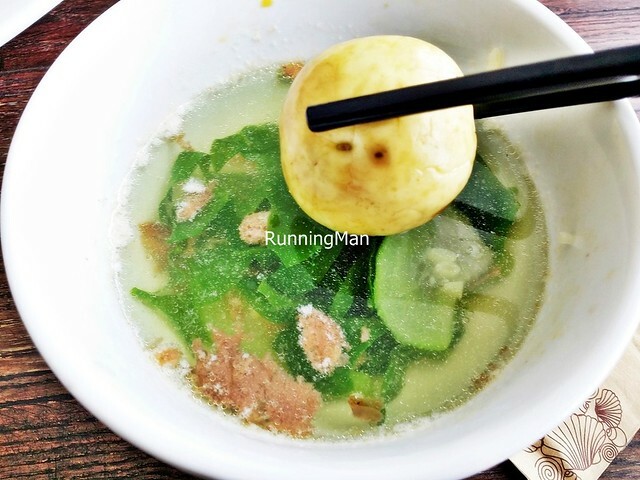 The Canh Cua Rau Đay / Crab And Vegetable Soup is a thin, savoury, clear soup / broth made with water, fresh mud crab (with deshelled crab meat), luffa gourd, spinach, salt, pepper, onions, garlic, and bush okra / jute mallow. The Cà Muối / Salted Eggplant is a preserved, salty snack, served on the side. You're supposed to take 1 bite of this, followed by 1 spoonful of soup, combining the flavours of both. Clams are a common seafood dish here, served either boiled, grilled, stir fried, or in a soup / broth. The Canh Ngao Nấu Chua / Sour White Clam Soup features fresh clams, tomatoes, and pineapples, in a tangy, sour, Thai inspired soup / broth. This is made with onions, shallots, ginger, dill, bean sprouts, water, salt, fish sauce, clam shell stock, and coriander. Often consumed during cold weather. Chè Chuối / Caramelised Banana And Sago In Coconut Milk Soup is a refreshing, sweet dessert commonly sold along the streets of Hanoi, Vietnam. 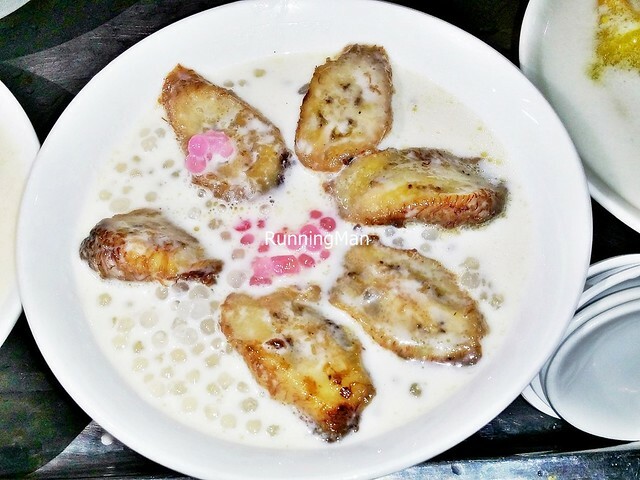 It consists of ripe bananas, grilled till caramelised, along with coconut milk, coconut water, and sago / tapioca balls, garnished with roasted peanuts and served hot. A bowl of ice is served on the side, scoop as much as you want into the dessert, to cool it down. 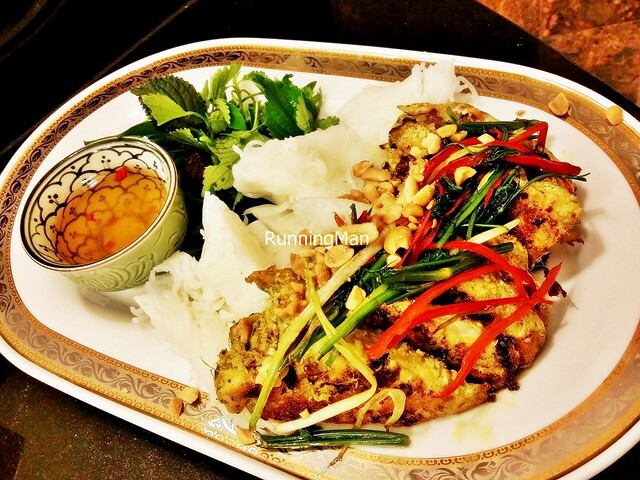 A dish which originated in Hanoi, but is now popular across Vietnam, Chả Cá Thăng Long / Pan Fried Turmeric And Dill Fish Noodles is a savoury, satisfiying dish. 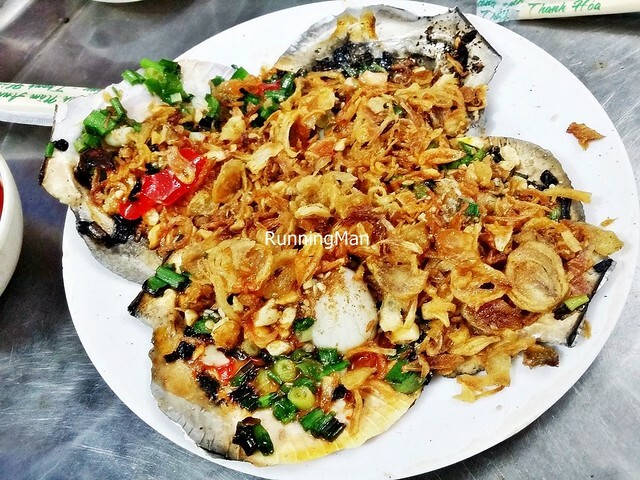 The star is the grilled / pan fried fish, fragrant and savoury, made with fresh red snapper / monkfish / catfish / snakehead, marinated with fish sauce, powdered turmeric, garlic, ginger, shallots, onions, pepper, and dill. 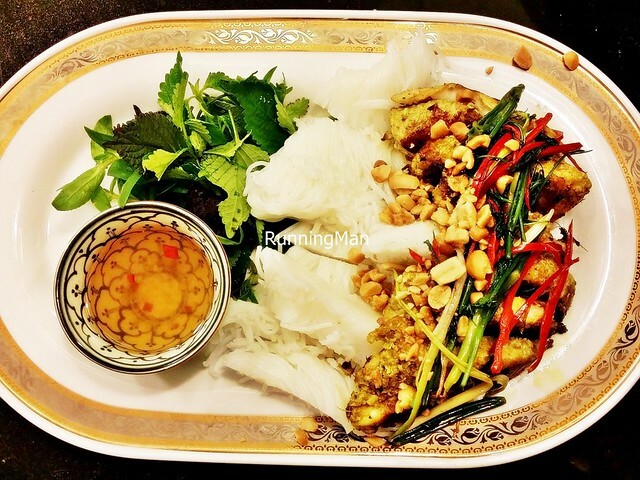 It's served with thin rice vermicelli noodles, roasted peanuts, fresh dill, and a spicy chili dipping sauce. Incredibly tasty! Dưa Xào / Pickled Mustard Leaves And Pork is a simple Chinese inspired stir fried dish, made with pickled mustard leaves, sliced pork loin, sliced pork belly, tomatoes, garlic, scallions, salt, fish sauce, sugar, pepper, and chili. The result is a pronounced sour salty dish, often eaten along with white rice. The vegetables should still have some crunch for texture, not limp or dry. 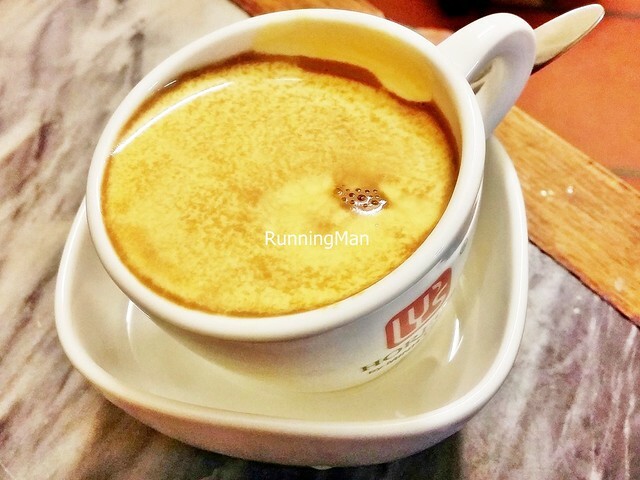 Egg Coffee is a sweet Vietnamese dessert beverage, a staple in Hanoi since 1950, though other parts of Vietnam have started selling this since 2014. Described as a liquid 'Tiramisu', Egg Coffee was said to have been invented when milk was scarce during the war. 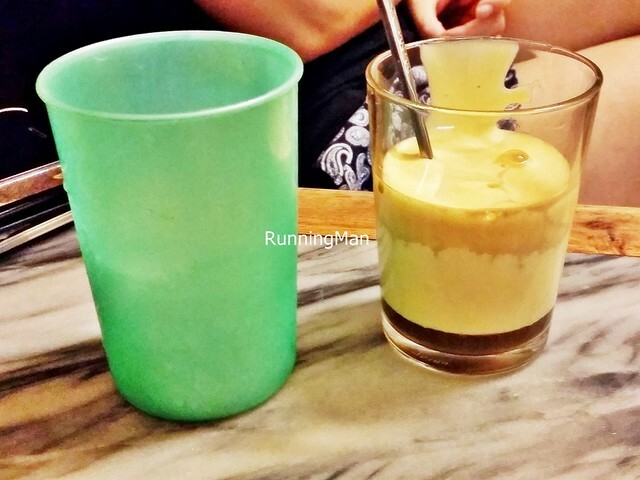 This drink is made by beating chicken egg yolks with sugar, coffee, condensed milk, butter, and cheese, then extracting the coffee into half of the cup, followed by a similar amount of egg cream. 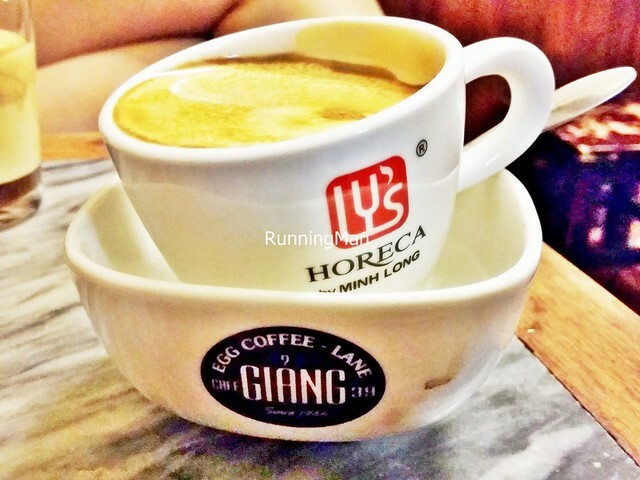 It can be served hot (in a warm water bath) or cold (ice on the side), and the most well known place for Egg Coffee is Giang Cafe in the Old Quarters. Miến Cua Ngao / Stir Fried Vermicelli is a quick, savoury stir fried dish, made with thin cassava / sweet potato / tapioca vermicelli noodles, ginger, spring onions, bean sprouts, chicken eggs, fish sauce, light soy sauce, powdered turmeric, shiitake mushrooms, and shallots. While this is the basic dish, other garnishings of seafood are often added, such as prawns / shrimp, deshelled mud crab, or squid. 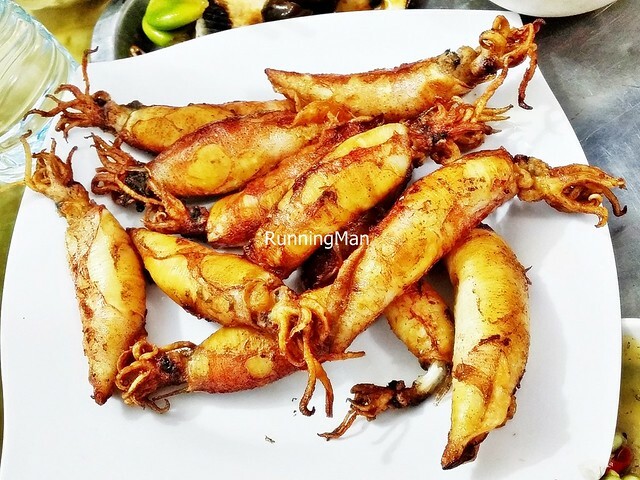 Mực Trứng Chiên Xào / Fried Crispy Squid With Roe is a common seafood dish, made by stir frying / deep frying fresh, medium sized squid (with egg roe within), that have been coated with a spice batter of garlic, ginger, sugar, all-purpose flour, salt, and pepper. This crispy squid dish is often eaten as a main dish, along with other seafood dishes as part of a communal meal. Normally, a spicy chili dipping sauce, and a salt and lime juice dipping sauce, is served with this. The deep fried Nem Cua Bể / Crab Spring Rolls are a coastal speciality, made with fresh deshelled mud crab, minced pork, chicken eggs, carrots, bean sprouts, thin rice vermicelli noodles, fish sauce, wood ear fungus / jelly ear fungus, and kohlrabi / turnip cabbage, all wrapped in rice paper and deep fried. The shape can be either cylindrical or cube, and it's usually served with a spicy chili dipping sauce. 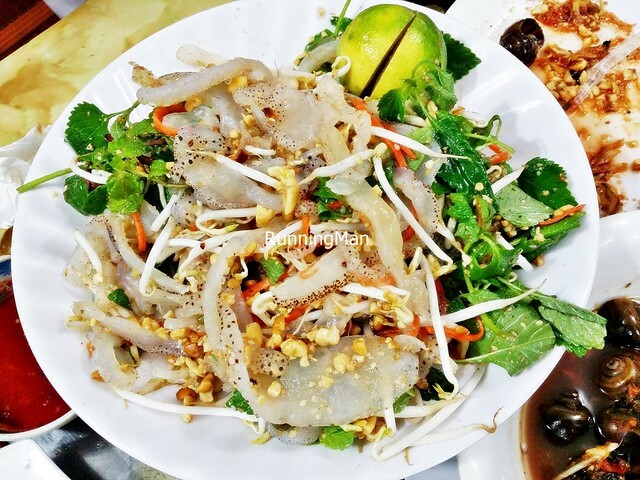 This fresh and bright summer dish of Nộm Sứa / Jellyfish Salad features boiled Vietnamese jellyfish strips, shredded chicken, shredded young / green mango, carrots, bean sprouts, and onions, all tossed together with basil leaves, vinegar, sugar, light soy sauce / salt, pepper, fish sauce, chili, shrimp paste, lemon juice / lime juice, roasted peanuts, and coriander. This refreshing and cheery salad, with its mixture of tastes (sweet, sour, salty, zesty, fruity) and textures (crunchy, chewy, soft), is perfect as a side dish or an appetizer. Often served in Hanoi stalls in Vietnam which specialise in seafood dishes, the Sò Diệp Nướng Hành / Grilled Scallop With Scallions is popular amongst locals. These fresh scallops are grilled with salted butter, chives, scallions, fish sauce, crushed garlic, and roasted peanuts. 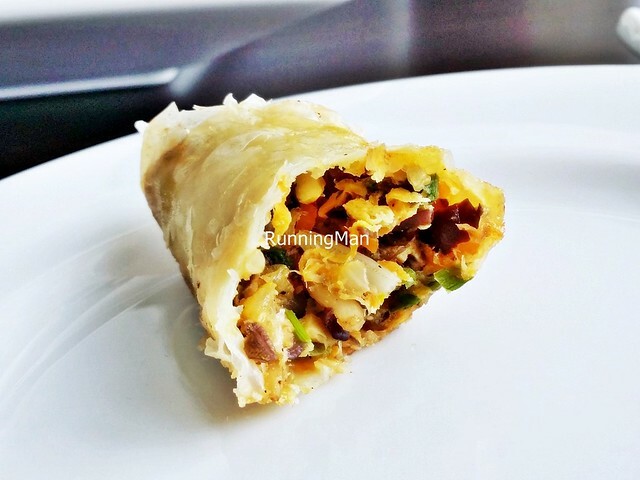 The result is a savoury sweet dish, light yet utterly delicious. 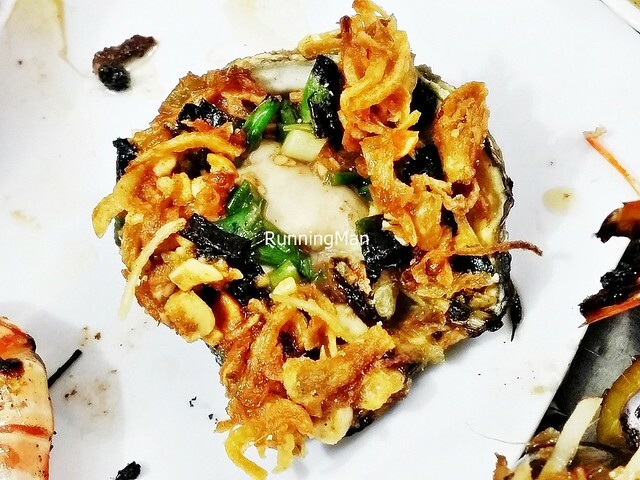 Similarly, the Con Hàu Nướng Hành / Grilled Oyster With Scallions features fresh, plump oysters, grilled with salted butter, chives, scallions, fish sauce, crushed garlic, and roasted peanuts. The difference lies in the taste, as the oysters have an added layer of salty, briny flavour, along with the savoury sweet taste. Thịt Ba Chỉ Kho Trứng Cút / Braised Pork Belly With Quail Eggs is a home style comfort food, more common in Hanoi households than other parts of Vietnam. Made by braising pork belly and quail eggs (which lend a richness), together with minced garlic, shallots, sugar, sweet soy sauce, fish sauce, salt, pepper, coconut water, spring onions, and chili. 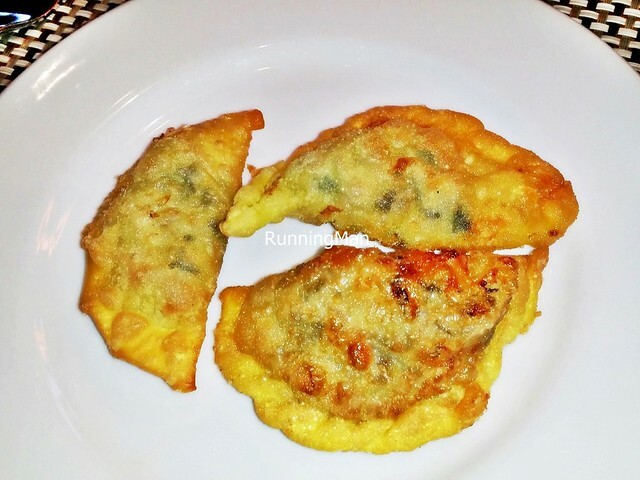 This simple, savoury sweet, appetizing dish is often eaten together with white rice. 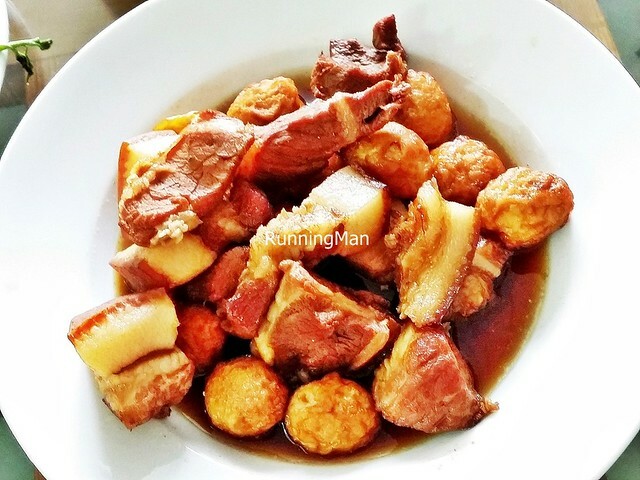 Thịt Rim Tiêu / Claypot Soy Braised Pork bears much similarity to several other pork dishes above, the difference being that it's usually more savoury and salty than other similar dishes. 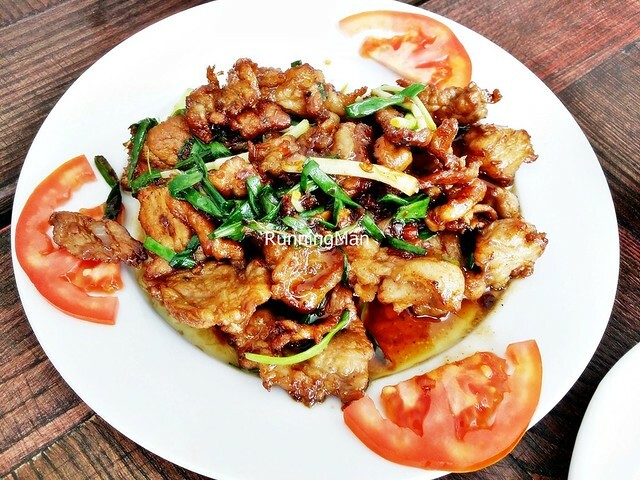 This is due to the pork loin and pork belly being claypot braised in salt and light soy sauce, together with minced garlic, ginger, coconut water, sugar, fish sauce, and pepper. Garnished with spring onions, it's served with tomatoes and eaten with white rice. 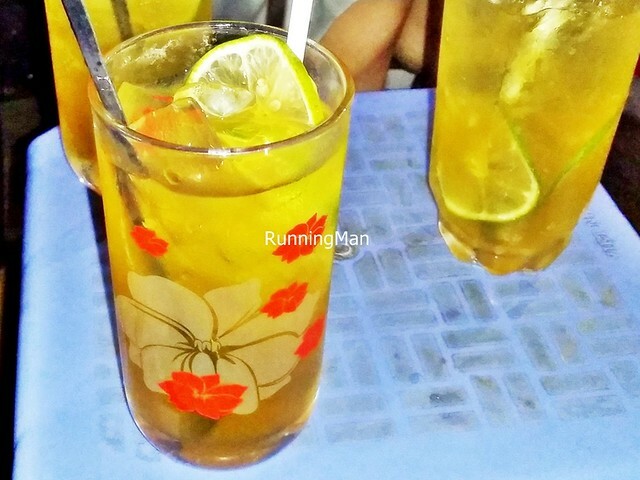 Trà Chanh / Lemon Tea is a Vietnamese style dessert beverage, usually served chilled. This refreshing yet very sweet drink is made with either green tea or black tea, mixed with sugar, lemon juice / lime juice, and water. 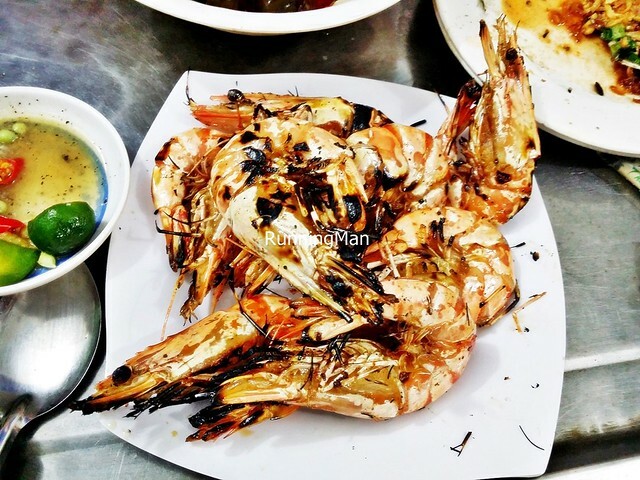 Commonly sold in most local seafood stalls, Tôm Nướng / Grilled Prawns usually consist of medium to large sized prawns / shrimp, which helps to retain some moisture even after being grilled. It's usually marinated in garlic, fish sauce, and pepper for added flavour, before it's grilled. Tôm Rang Thịt Ba Chỉ / Stir Fried Baby Shrimp And Pork is a home style Hanoi comfort dish, not common in other parts of Vietnam. 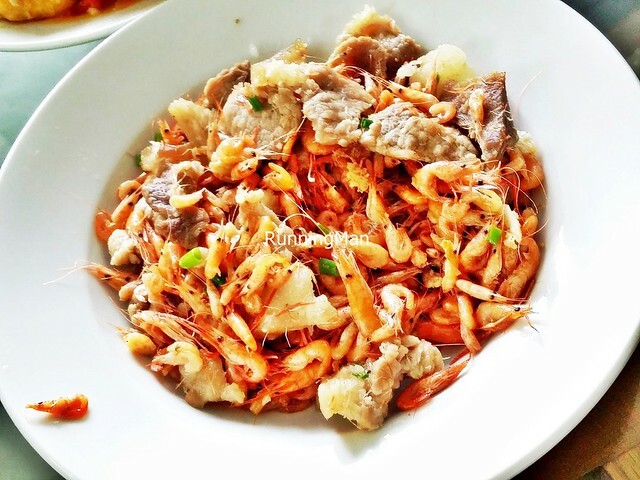 The savoury, crunchy dish is a home cooked delight, made by stir frying pork loin and shell-on baby shrimp / prawns, in sweet soy sauce, sugar, fish sauce, minced garlic, salt, sugar, pepper, and chili. 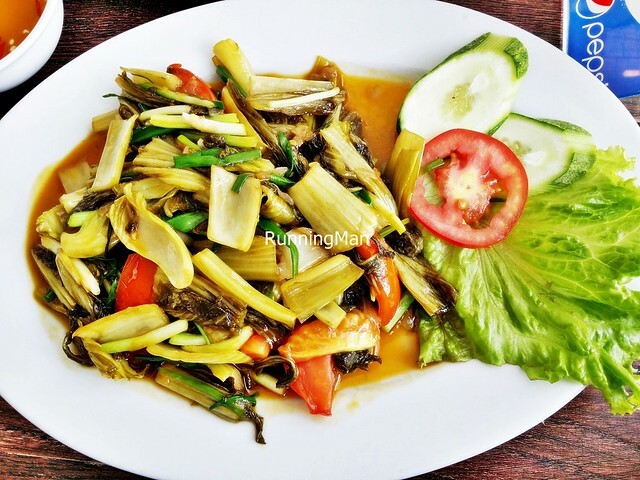 Garnished with spring onions, this dish is a delightful combination of textures (chewy, tender, crunchy) and is eaten together with white rice. 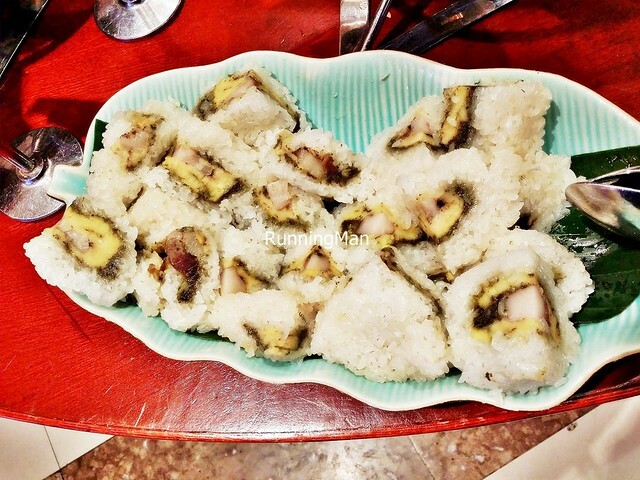 Xôi / Sticky Rice is a typical Vietnamese fast food, popular in many areas. You can't visit Vietnam without seeing Xôi / Sticky Rice! 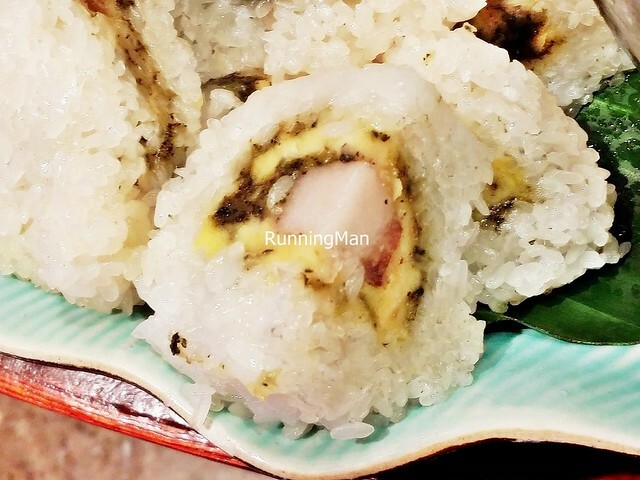 The most basic savoury version, which gives its name, is made by cooking sticky rice / glutinous rice in pork fat, which results in a dry and sticky texture. When other ingredients are added, it goes by different names. 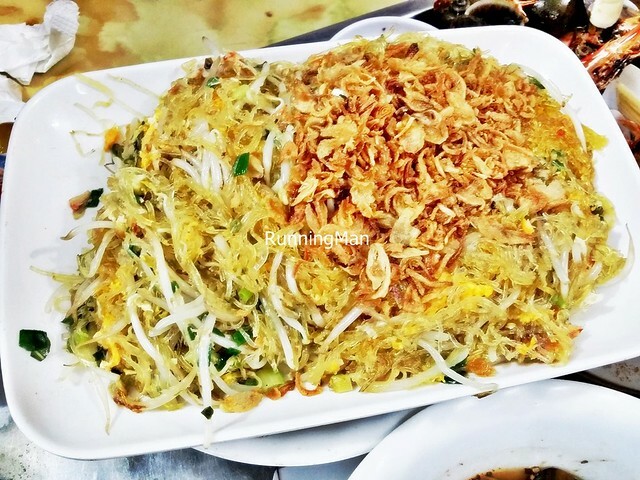 In Hanoi, the most common savoury version is Xôi Xéo / Sticky Rice With Shallots And Mung Bean, where yellow sticky rice / glutinous rice (cooked with powdered turmeric and pork fat) is topped with fried shallots, and mashed mung beans. Xôi Xéo / Sticky Rice With Shallots And Mung Bean can be eaten throughout the day, and is very filling. 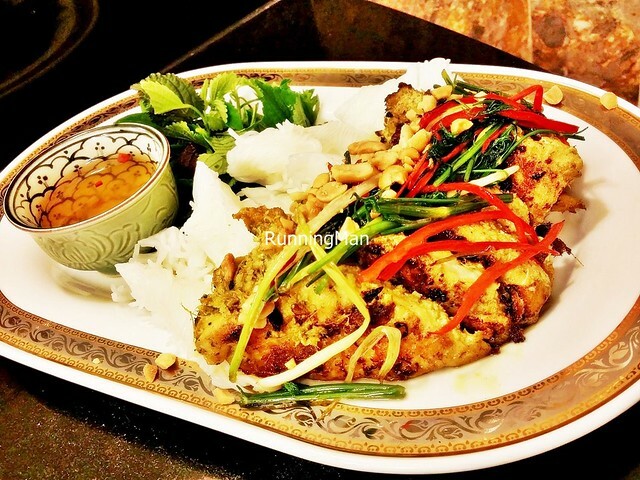 It's possible to combine all the savoury ingredients offered for Xôi / Sticky Rice into a 1-dish, heavy, fulfilling meal. Such a dish has a mouthful of a name; Xôi Xéo / Sticky Rice With Shallots And Mung Bean, Lạp Sườn (Chinese dried pork sausage), Giò Bò (beef sausage), Giò Lụa (pork sausage), Xỉa Thịt Lợn (pork floss), Thịt Lợn Băm Nhỏ (minced pork), Gà (chicken), Trứng Gà (chicken egg), Chả Mỡ (grilled fat), otherwise known as Xôi Thập Cẩm / Sticky Rice Mixed With Everything. 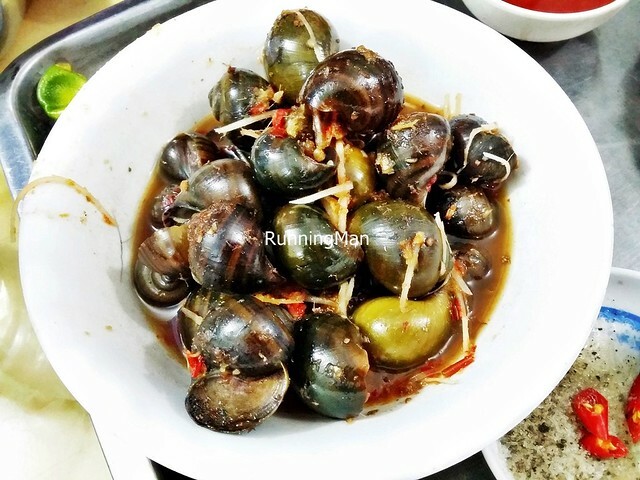 Ốc Mít Luộc / Boiled Snails are a Vietnamese favourite, made by boiling freshwater snails in water, sugar, salt, fish sauce, tamarind pulp, garlic, ginger, and chili. The result is a savoury, sweet, sour, and spicy dish, usually eaten with a toothpick and your fingers.